This is the historic and economic story of the Old North State, from Colonial times to the 21st Century. The early history of business in North Carolina is much more complex and developed than has previously been reported. This lack of recognition could have been caused by relatively few surviving journalistic publications of the period and the disruption caused by the Civil War. This site will provide detailed histories of industries (click for specific industries) and individual businesses, as well as biographical entries on some of the major business leaders in North Carolina. North Carolina began as an agricultural colony and state. One problem affecting commerce through the 17th and early 18th centuries was the limited transportation, with much of the state's products having to travel down river through Charleston and South Carolina or through Virginia. Examples of early rural industries included wagon making, grist mills, cotton gins, saw mills, cane mills, cabinet/furniture making and much more. In 1790, North Carolina ranked third in population in the U.S., but steadily slipped to fifth place by 1820. The population basically stayed level until 1840 due to ongoing emigration from the state to new states. In 1810, the state was one of the leading industrial states, outranking Massachusetts. But reliance on agriculture, closing of British ports and economic malaise caused the state to drop well down the industrial list by 1830. For example, a great depression set in prices for North Carolina products during the 1820s and early 1830s. The loss of West Indies trade has lessened demand for lumber and heavy British taxation on tobacco depressed that market. North Carolina cotton began feeling the impact of new cotton fields in Gulf Coast states. Poor transportation exacerbated the problems. Few navigable rivers and little road building had the state and residents at a serious disadvantage. Steamboats first appeared in North Carolina waters in 1812, with a local steamboat building business starting in 1818. Between 1818 and 1870s, many steamship companies were founded easing transportation in the eastern portion of the state. Freight rates dropped on river routes. But rivers in the state were generally small and difficult to navigate. The result restricted steamboats to the east with one exception. More than 100 merchant steamboats plied North Carolina rivers and sound between 1812 and 1860. Strategic canals were built to aid water transport. In the 1840 census, there were 379 North Carolinians working on steamboats and river boats, as well as 327 people on ocean-going ships. The coming of railroads would gradually impact river transportation business, however, an additional 100+ steamboats would be built and used to serve portions of the state into the early 1900s. The first railroad was chartered in 1834 and construction began in mid-decade. By 1840, the Wilmington and Raleigh Railroad had 161 miles of track in operation, while the Raleigh and Gaston Railroad had 81 miles in operation. The effect generally was to lower transportation costs. The North Carolina Railroad open for business by 1856 with 223 miles of track connecting the other two railroads. Local wagon, carriage & buggy manufacturers continued to expand in towns across the state. In the 20th Century, North Carolina became home to national trucking firms (such as Carolina Freightliner) and aviation companies (Piedmont Airlines). During the 1820s and 1830s, entrepreneurs created cotton mills, built mills, constructed forges, organized gold mines, opened carriage factories, ran stores and engaged in other businesses. Agriculture was the leading pursuit. The nation's first Gold Rush propelled that industry with up to 20,000 workers and the state's second largest business during the 1830s. By 1840, there were more than 3,400 manufacturing establishments  primarily mills of different types  in the state with 14,322 people working in these establishments. There were 1,734 North Carolinians working in mercantile firms. There were 1,068 retail dry goods and other stores in the state. Of course, the vast percentage of the working population was engaged in agriculture. There were 3,689 manufacturing establishments in the state in 1860. In 1870, there were 3,642 firms with 13,622 employees. While the number of facilities remained static over the decade of the 1860s,, the Civil War gave a boost to the state's manufacturing facilities. New and expanded cotton and woolen mills, tool making, foundries, medicines and other businesses were created. The manufacturing firms in 1870 were much larger and their output had twice the value compared to 1860. Leading industries in 1870 (with more than $1 million in output) were building materials, cotton goods, food and food preparations and lumber. Sectors with almost a million dollars in output were naval stores and tobacco, with carriages/wagons, shoes/boots, iron and leather goods all having nearly a half million dollars each in output. The 1870s show both a financial panic (depression of 1873) and an emerging industrial revitalization in 1879. Agriculture would remain the leading industry through today. The leading crops over the years were cotton and tobacco. By 1860, there were more than 67,000 farms in the state with two-thirds under 100 acres. By 1900, there were 224,637 farms and in 1925 there were 283,482 North Carolina farms. By the end of the 1920s, North Carolina led the nation in production of cotton textiles, wooden furniture, and tobacco products. The cotton crop remained static between 1860 with 145,514 bales and 1870 with 144,935 bales. But other crops declined. For example, tobacco dropped from 32.9 million pounds in 1860 to 11.2 million pounds in 1870. Other crops showed similar declines, such as wheat, oats, corn, rice, sweet potatoes. By 1900, North Carolina was producing 433,000 bales, which accelerated in the early 1900s to match the explosive growth of the textile industry. By 1925, North Carolina was producing 1,102,000 bales of cotton. Tobacco manufacturing grew rapidly in Durham and Winston area after the Civil War, while the furniture industry built factories in High Point during this same period. Tobacco was mostly small farmer product and home manufactured during the years preceding the Civil War, although 97 such factories were operating in 1860. One of these firms had more than 50 workers. James R. Greene bought R. F. Morris' tobacco factory in 1862 and continued to produce Spanish Smoking Tobacco during the Civil War that was popular with Confederate soldiers. At the end of the war, Union soldiers discovered the company's products.. Orders came rolling in after the war causing Greene to add W.T. Blackwell as a partner to provide additional capital. With other brands calling themselves Spanish smoking tobacco, Greene needed a new brand and the company coined "Bull Durham Smoking Tobacco." In 1870, there were 111 tobacco factories employing 1,465 employees and producing 11.2 million pounds of tobacco. 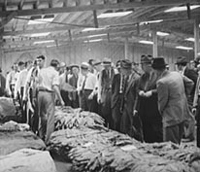 In 1900, North Carolina produced 127.5 million pounds of tobacco which grew to 380.2 million pounds in 1925. In 1920, Winston-Salem and Durham factories produced 20% of all tobacco products sold in the U.S. But there were extractive industries (iron and gold mining) beginning in 1770s and growing through the 1850s. For example during the revolutionary war, James Milles managed the iron furnace on Tick Creek, Chatham County, NC, for the Revolutionary government of North Carolina during 1777. With the discovery of the "Big Ore Bank" east of Lincolnton, Lincoln County in 1789, iron making became a significant industry, beginning about 1815 in the Piedmont and lasting through the 1870s. There are still ongoing iron and steel manufacturing in the state. The discovery of gold in 1798 in Cabarrus County and subsequent gold mining successes made the state the leading producer of gold in the U.S. until 1849 and the California gold strike (1848). America's first gold rush occurred in the North Carolina Piedmont during the late 1820s and early 1830s. 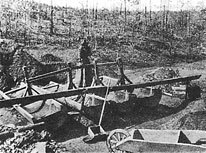 Gold mining was the second leading occupation (behind agricultural) before 1860. Some coal mining attempts were made just prior to the Civil War but never amounted to much. With the creation of the first textile mill around 1815 by Michael Schenck in Lincoln County, North Carolina began a long process towards building manufacturing industries. Schenck's first mill operated around 1815 (construction may have started in 1813), followed by a second mill from 1816-1819 with partner Absolom Warlick on McDaniel's Spring (just east of Lincolnton). 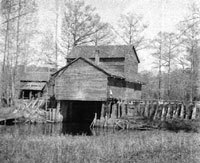 He then built another mill on the South Fork of the Catawba River (just south of Lincolnton) with partner John Hoke and Dr. James Bivings (1819) which remained in production until 1863. Henry A. Donaldson built the second and third textile mills in the state (in Edgecombe and Cumberland counties). An 1822 report on textile manufacturing warned: "our citizens must turn a portion of their labours and enterprise into other channels of industry (other than agriculture and extractive efforts); otherwise, poverty and ruin will fall on every class of our community." Textile mills spread throughout the Piedmont region, such as the Spray mills and industrial complex first started in 1839. There were about 45 textile mills in operation by 1860  39 cotton and 7 woolen mills. These antebellum textile mills were small water-powered operations that generally did not survive the Civil War. However following the war, many were restarted by pioneering textile families on the same sites. Textiles would rebound leading to the First Cotton Mill Campaign during Reconstruction. By 1870, 85 textile firms manufacturing various cotton and woolen goods were operating in the state, employing more than 3,000 workers, with nearly $3 million in capital and about $3 million in products. There were 118 such firms in operation by 1890. In 1899, North Carolina had 177 textile mills with 30,273 workers and 1.1 million spindles - ranked behind the nation's leader Massachusetts, Rhode Island, South Carolina and New Hampshire. The state produced $28.4 million in textile products, slightly behind South Carolina with $29.7 million and far behind Massachusetts with $110.5 million. That order would all change by 1925. In 1923, there were 351 mills in North Carolina, employing 81,041 workers producing $326.5 million in goods. Only Massachusetts would edge the Old North State. 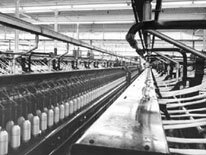 The 20th Century saw the rise and dominance of North Carolina in the textile industry. As the 20th Century closed, problems had began to multiple for the textile industry  severe price competition from foreign products and weak economic conditions at both the beginning and end of the 1990s. The result was the bankruptcy, reorganization and liquidation of many textile firms. Tens of thousands of textile jobs disappeared. There were many local cabinet (furniture) makers during the colonial and early statehood period, but little organized industry. One of the largest furniture making business prior to the Civil War was operated by Thomas Day, a free black living in Milton, NC, from the early 1830s to about 1857. During the business' most prosperous years, he employed as many as 80 workers providing furniture to many influential people in both North Carolina and Virginia, as well as winning contracts with state government in the design of several building interiors at the University of North Carolina at Chapel Hill. But large-scale furniture manufacturing would wait till the 1880s. 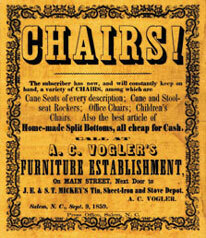 Access to raw supplies and inexpensive labor propelled the growth of the furniture industry in North Carolina. In 1911, the Southern Furniture Manufacturers' Association was founded with headquarters in High Point, NC, "to promote harmony among manufacturers of furniture, secure concessions in freight rates... and further the interests of its members." The annual and then semi-annual furniture markets in High Point helped propel the state into the leadership role for the business. Early banks chartered by the state were the Bank of Cape Fear (1804), the Bank of New Bern (1804) and the State Bank of North Carolina (1810). By the start of the Civil War there were about 20 state banks. These banks generally closed immediately after the conflict with the canceling of state war debt. Following the Civil War, new banks were launched with federal and state charters. Federally chartered banks at the time could not make loans with land as the security, plus limits on loans to any one person posed a significant impediment to those harvesting and marketing cotton and tobacco, which required large funds at certain seasons. 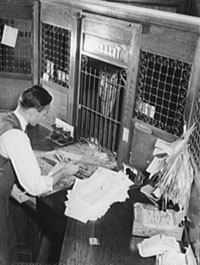 With the expansion to interstate banking in the 1980s, North Carolina banks began expanding, often picking up banking operations in trouble in other states. Today, Charlotte is the second largest banking center in the U.S., following only New York. Both Bank of America and Wachovia are headquartered in the city and are among the top five banks in the country. North Carolina during the 1800s. Among the materials covered by the North Carolina Business History web site in all eras (including antebellum, Civil War, post Civil War, 19th century, 20th century, 21st century) are: canals, canal boats, railroads, steamboats or steam boats, boat building, plank roads, trucks and trucking, autos and horseless carriages, buggies, carriages, wagons, manufacturing, textiles, cotton mills, woolen mills, paper mills, furniture making, mining, gold, mint and mints, precious gems, agriculture, cotton, rice, tobacco, turpentine, financial services, insurance, banks and banking, bank holding companies, insurance companies, domestic and foreign, insurance agents, population of North Carolina cities and towns in the 19th and 20th centuries, etc. 2002-2007 Copyright. CommunicationSolutions/ISI for web site & content.